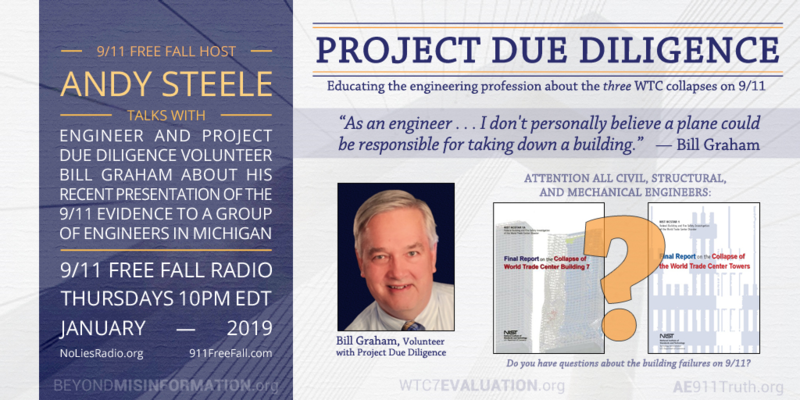 Host Andy Steele is joined by engineer and Project Due Diligence volunteer Bill Graham to discuss Bill’s recent presentation of the 9/11 evidence to a group of engineers in Michigan. In the first ten minutes of the show, Andy reviews a news article about YouTube’s latest round of attempts to combat allegedly “harmful” 9/11 truth videos on its platform. Host Andy Steele is joined by engineer and Project Due Diligence volunteer Bill Graham to discuss Bill’s recent presentation of the 9/11 evidence in Michigan. In the first ten minutes Andy also goes over an article that covers YouTube’s new attempts to combat allegedly “harmful” 9/11 truth videos on its platform.